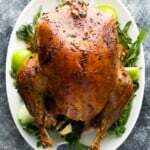 Dry brined turkey with garlic sage butter is juicy and delicious! Using a dry brine is so much easier than a wet brine, and gives this turkey so much flavor. 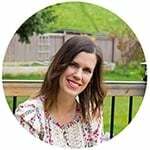 After celebrating Canadian Thanksgiving last month, I started thinking that it was about time I share my favorite turkey recipe with you guys! I LOVE experimenting with different turkey recipes, and once I discovered the amazingness of brining a turkey, I could not go back. But. Using a wet brine is labor intensive and kind of stressful (if you’ve ever tried to get a huge turkey into a brining bag you know what I mean). Then I discovered dry brined turkey, which eliminates the need for a giant pot/brining bag/extra cooler. All you do is rub a salt mixture over your turkey! So much simpler, and to my surprise, just as flavorful, and the skin ends up much nicer. it is so much easier than a wet brine! 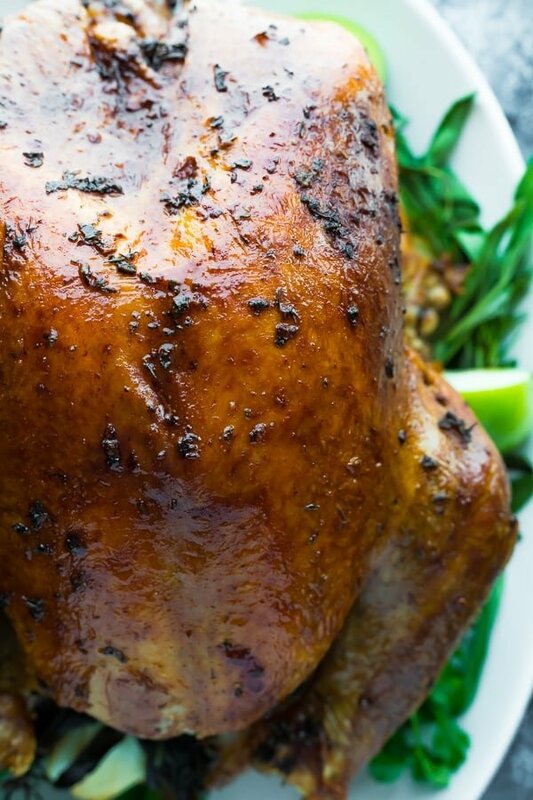 Dry brined turkey helps lock in moisture by loosening up muscle fibres, helping them absorb more moisture. It also gives the turkey meat a delicious seasoned flavor. rub the turkey skin with butter or oil (I used a garlic sage butter). Avoid a salty rub as your turkey will already be plenty seasoned! 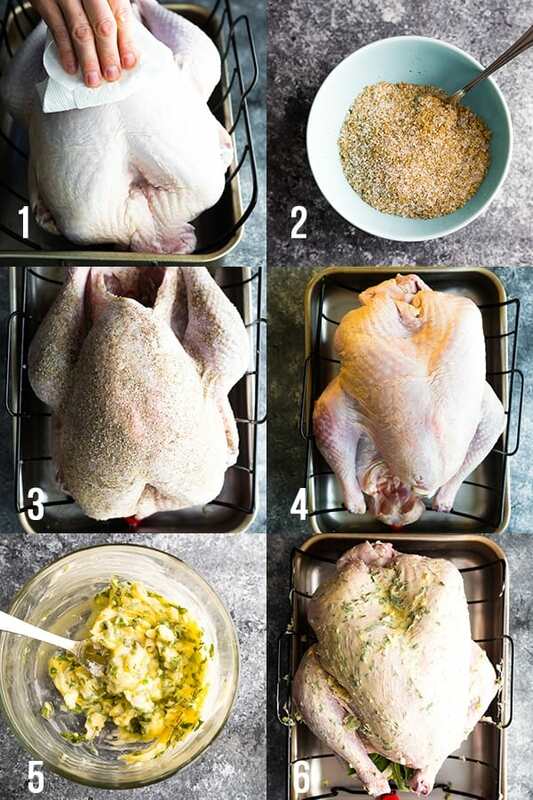 be careful with salt- if you are seasoning the skin of your turkey after rinsing off the brine, make sure you don’t use salt. If preparing gravy from the juices, taste before you add any salt. pick a turkey that has not been pre-seasoned or injected with anything. Kosher turkeys have already been brined so they are not suitable for this recipe. A brined turkey cooks faster, so make sure to check your turkey’s temperature early! How long to cook a turkey entirely depends on the size and weight of your turkey, so make sure you take a photograph of the tag with the weight of the turkey before you discard the packaging! 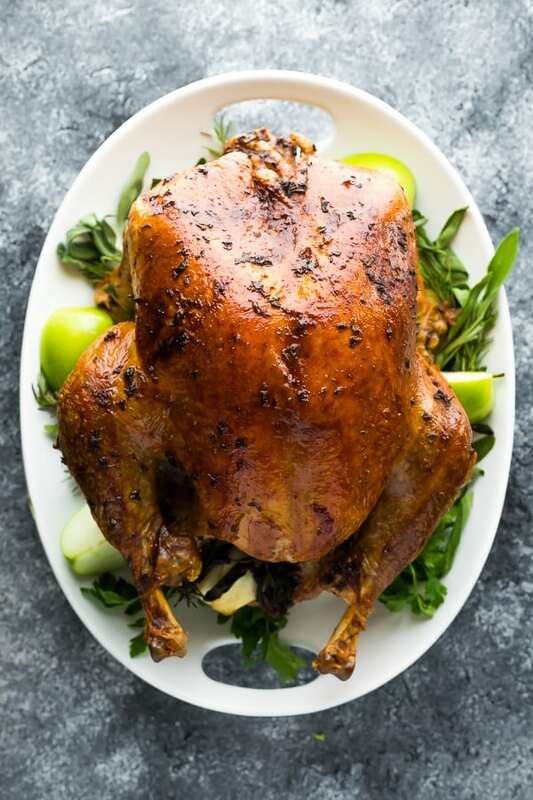 The general rule is to roast turkey for 10-15 minutes per lb HOWEVER since a dry brined turkey can cook quicker, I recommend checking your turkey’s temperature early, at around 2 hours. To tell if your turkey is done, take the temperature of the thickest part of the thigh. Once it reaches a temperature of 165°F, it’s ready to come out of the oven. I found this video helpful in finding the thickest part of the turkey thigh. For the record, my 17 lb and my 14 lb roast turkeys were both done between 2 1/2 -3 hours, hence my recommendation to check your bird’s temperature early. If your turkey is done early, tent it in foil to keep it moist. It will hold the heat for several hours! has amazing reviews on Amazon (and is reasonably priced) if you’re in the market! looking for more Thanksgiving recipes? Check out this Instant Pot Cranberry Sauce, these Herb & Garlic Instant Pot Mashed Potatoes and this Make Ahead Sage Apple Stuffing! Or try this Crock Pot Ham recipe! Thaw the turkey according to package directions. Pat the turkey dry. Remove the giblet and neck, and set aside for making gravy or stock (if desired). Place the turkey on a rack in a roasting pan. Mix together the dry brine, and rub all over the turkey skin (breast & back) and inside the cavity. 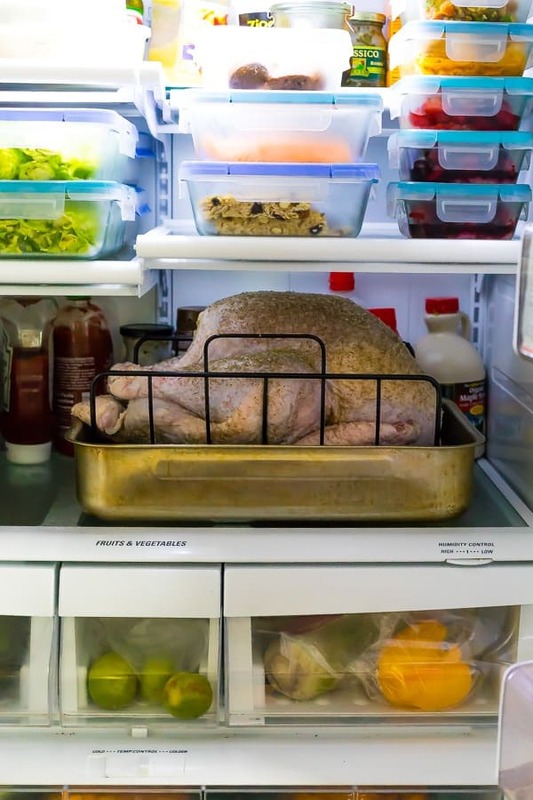 Let the turkey sit uncovered overnight in the fridge. 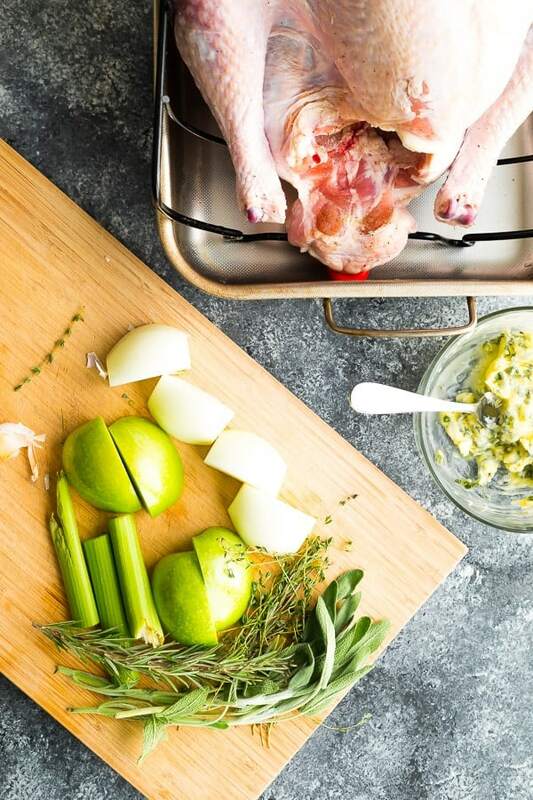 Remove turkey from the fridge and rinse off the brine (don't forget to rinse the cavity, too). Pat turkey and roasting pan dry. Make sure none of the salty dry brine is in the roasting pan as this can make your pan juices too salty for gravy. Bend the turkey wings backwards and tuck under the bird. Place turkey in the pre-heated oven, then reduce the temperature to 325°F. Roast turkey for 2 hours, basting with pan juices every 45 minutes, before taking the temperature. For a 14-17 lb turkey, 2 1/2-3 hours were perfect (see note **). Check the temperature in the thickest part of the thigh and the breast, turkey is cooked through when it measures 165°F. When turkey is cooked through, remove from oven and allow to rest for 30 minutes. If your turkey is done early, tent with foil to keep it warm. If you're just waiting 30 minutes before serving, no need for foil. This recipe was tested with 6.5 kg (14 lbs) and 7.6 kg (16.7 lbs) turkeys respectively. *I have been known to soak a square of cheesecloth right in the melted butter and lay it over the turkey breast. Keep basting every 30 minutes, and remove the cheesecloth during the last 30 minutes of cooking to brown up the breast meat. **A general rule is to cook your turkey for 10-15 min per lb, however I highly recommend checking your turkey's temperature early as brined turkeys can cook more quickly. I am going to try your recipe for Thanksgiving. I’m a little concerned about the fresh garlic burning. You didn’t find this to be the case? Also what are your thoughts of using a smaller amount of dried herbs as opposed to fresh? Thank you for all your delicious recipes! Hi Cindi! You can leave it out if you’d like. Sorry for my late reply. Hope you had a happy thanksgiving!